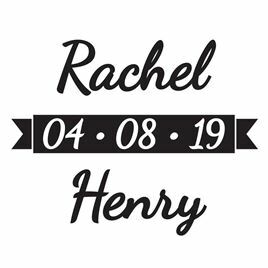 A simple banner design highlights your wedding date while your first names appear above and below the banner on this patent-pending, personalized custom stamp by PSA Essentials. Lettering only available as shown. Each stamp is packaged in a decorative paisley box. Stamp measures 2 1/4" x 5" and impression size is 1 5/8" in diameter. One black ink cartridge is included. Each ink cartridge yields up to 10,000 impressions. This item will ship separately from the rest of your order. Please allow 10 days for production.